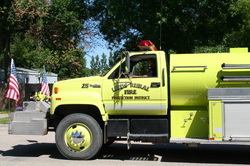 The Leeds Rural Fire Protection District has a volunteer roster of 25 active firemen and covers an area of over 400 square miles. The department currently has 5 trucks, highlighted by a brand new pumper truck that was purchased in 2007. Two tanker trucks give the firemen a total water carrying capacity of about 7000 gallons. The department also has two four wheel drive grass fire trucks that have sidewinder units attached. The firemen have training drills the first Tuesday of each month and respond to an average of 40 calls per year. One of the fire trucks is equipped as a heavy rescue unit carrying auto extrication tools and assists the ambulance squad with vehicle accidents. Many firemen have obtained their auto extrication certificate and are trained on the tools and techniques required to remove a patient from a vehicle accident safely and quickly.